Fitted Elastic Table Cover from Collections Etc. 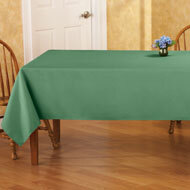 Durable vinyl tablecloths wipe clean and feature elasticized edges for a smooth & snug, no-slip fit. With a soft flannel backing, it's available in 8 colorful designs to complement any decor. Plastic and Polyester. Round fits tables to 48"Dia. Oval fits tables up to 68"L. Available patterns in Fruit, Blue Print, Hydrangea, Sunflower, Ivy, Apples, Butterflies, and Strawberries. Sizes available in 48" Round or 68" Oval. I love these inexpensive covers!!! My outside table has a new look!!! I love apples and the color is so vibrant, fits table perfectly. - Edith, Germantown, Md. Happy with cover. Fit my table perfectly. This product was a good buy. Instant "do over" fpr your patio table! I love this table cover! have sent for these before, durable! I love the table cloth. This is not the first one I have bought. It is great in kitchen when I have children,just wipe it off and it is ready to go again. - Grammie, Bogalusa,La. I would buy this tablecloth again. I would and have bought this product again. Pleased with the table covers. Will be buying other patterns! For one thing you cant find fitted tablecloths here.The price is right,and yours is very nice. - Sweety.....LOL, Anderson,In. Keeps my table top clean. USED FOR WHAT IS WAS MENT FOR, ON MY PATIO TABLE - WEEWILLIE, VACAVILLE CA. 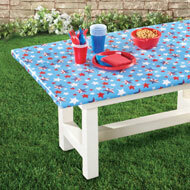 Great looking tablecloth for picnic table. Used on a table in my basement just love it I bought the Ivy design washes nicely. Would buy it again and let my friends know. - snowflake, Adams, Wis.
Love it on my kitchen table , I just wish there were more different colors !! !They don't slide off the table !!! - blueeyes, New Haven, Mo. Great! Just what I wanted! Use this fitted tablecloth for my outdoor deck table. - Whitey, ct. I love how it is round and is fitted so it does not fall off. - Sue, vallejo,ca. This is a nice table cloth. 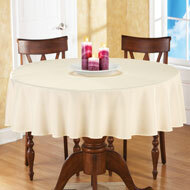 plan to order more fitted table cloths! I would pay this product again. This is a nice product.. I will keep purchasing these. i like the table cloth because there"s not anything hanging down to your lap. Wish it came in more colors. - Claude, Rippey Ia. Love the elastized edge of the table cloth. I'll be buying one of these again.  I was looking for a cover for our outdoor round table with umbrella. Was considering making one, then I checked collections, etc. and found the perfect one. It was the correct size and the elastic in it gave it a snug fit on our table. The only issue we had was to make the hole for the umbrella, which my wife did without a problem. It had held up for 3 or more rainstorms. Couldn't have made one any better for the price. - mailman, monson, mass. The fitted table covers are the best. I have a beautiful antique oak table and a 4yr. old grandson...he loves to do art projects , and this round table cover I purchased was the answer to my problem. It fits perfectly and serves the purpose...thank you! - MAK, Seattle, Wa. nice for covering and staying in place. Would definitely recommend &buy again! I love these table cloths!! I love the fitted table cloths and am always looking for new colors and designs!! Well done! - shopper Deb, Mi. Always liked these - April, Pacific Northwest! I love my new table cover!!!! This just gained a new use!! VERY FAST DELIVERY - MAMA MARY, BURTON MI. I can't believe they fit! Rarely do I get the measurements right. I wnted a table cloth to do crafts on. This fit my ovel table perfectly and is hardy enough to work on and attractive enough to sit and eat one if I wish to. - Foxy Loxy, Noth Bend, WA. I love having protection for my wood table. Love this product and would buy again. its on my kitchen table looks great!! - Robin, camden,s.c. Hard to find, but you had it. Most of products are very good, nice. Can return to Collections with no problems. Been a customer for a long time. Enjoy their products. - simple, Ontario, Ca. This was a gift. Loved the pattern. This, too was a gift for a child. I ordered her a strawberry ceramic tea set for her birthday, and when I saw the fitted strawberry tablecloth, from Collections, Etc. I thought, this would be great' plus !! - Betty B., Matthews, N.C.
A nice touch to our deck this season! Use it to cover my table - Susie, Bloomington, IN. Have used these table cloths before and works well. - LN, Ct. I would buy this product again, so far. love the fitted size now don't have to keep sliding the table cloth into place. - vickie, janesville wis.
Brightens up my patio table! very pretty and they fit very well. Great product. - none, Penna. i would buy these tablecloths again. Fits snug and looks great! It's not easy to use! I have sent all three tunics back, they were to big also not what I had expected. - grandy, Wichita Falls, Tx. Center of flowers are red not brown. Sunflowers are golden not PINK!!! 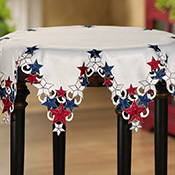 Spice up your dining table, dresser, or vanity with this patriotic star topper. Carefully crafted with the look of lacy tatting, this colorful table topper is beautifully embroidered with stars and gracefully scalloped edges. Polyester; machine wash. Imported. 35"Dia.